Sure to bring memories and a smile, this Little Golden Book "guide to life" is perfect for anyone who cherishes the sturdy little books with the shiny cardboard covers and gold foil spines! A humorous "guide to life" for grown-ups! One day, Diane Muldrow, a longtime editor of the iconic Little Golden Books, realized that, despite their whimsical appearance, there was hardly a real-life situation that hadn't been covered in the more than 70-year-old line of children's books—from managing money, to the importance of exercise, to finding contentment in the simplest things. 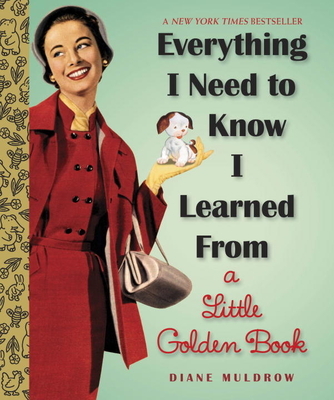 In this age of debt, depression, and diabetes, could we adults use a refresher course in the gentle lessons from these adorable books, she wondered—a "Little Golden guide to life"? Yes, we could! Muldrow's humorous yet practical tips for getting the most out of life ("Don't forget to enjoy your wedding!" "Be a hugger." "Sweatpants are bad for morale. "), drawn from more than 60 stories, are paired with delightful images from these best-loved children's books of all time—among them The Poky Little Puppy, Pantaloon, Mister Dog, Nurse Nancy, We Help Mommy, Five Pennies to Spend, and The Little Red Hen. The Golden greats of children's illustration are represented here as well: Richard Scarry, Garth Williams, Eloise Wilkin, J. P. Miller, and Mary Blair, among many others. Sure to bring memories and a smile, this book is a perfect gift for baby boomers, recent grads, lovers of children's literature—or anyone who cherishes the sturdy little books with the shiny cardboard covers and gold foil spines! DIANE MULDROW, editorial director at Golden Books, has written dozens of children's books, including We Planted a Tree, illustrated by Bob Staake. She edited Golden Legacy: How Golden Books Won Children's Hearts, Changed Publishing Forever, and Became an American Icon Along the Way, by Leonard Marcus. "Chicken soup for fans of Golden Books." "A fun and entertaining walk down memory lane... This title will be great for sharing one-on-one with children."